Our message is simple - don’t cut further. The more people who become trapped in a cycle of homelessness, the worse it will be for everyone. Research published today by Homeless Link, indicates that the average day centre is now seeing a quarter more people a day, than they were in 2010. 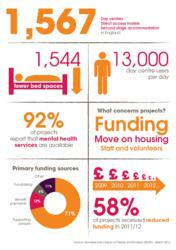 While on any one night, 80% of accommodation services surveyed say they have no empty beds for new homeless people. As well as running at full capacity, six out of every ten projects also had their budgets cut in 2011. With services facing an average cut of 15% to their funding, the research highlights the impact this is having on both homeless people and local communities. The reported availability of services to help clients settle into long-term housing has decreased. The number of paid professionals working in services fell by an estimated 11% in 2011. “These findings make unsettling reading. In hard times, we might not be able to stop people from losing their homes but we should be able to help them get back on their feet. “Cuts are causing fewer homeless people to get jobs and homes. This in turn is blocking-up services, reducing the help available for new homeless people and impacting on local communities. “Our message is simple - don’t cut further. The more people who become trapped in a cycle of homelessness, the worse it will be for everyone. "We call upon local communities to join our campaign and take a step to end rough sleeping by protecting funding for critical services." More than half (55%) of all projects have been informed of further cuts in local authority funding for services in their area for 2011/12. Homeless Link has launched a campaign called ‘Take a Step’, which aims to encourage everyone to play their part in ending rough sleeping. The ‘Survey of Needs and Provision’, which charts annual changes in homelessness, was carried out in November 2011 and involved 500 accommodation and day centre projects in England.